Duke Riley, Two Riparian Tales of Undoing, 2011. Photos by Ricardo Napoli. 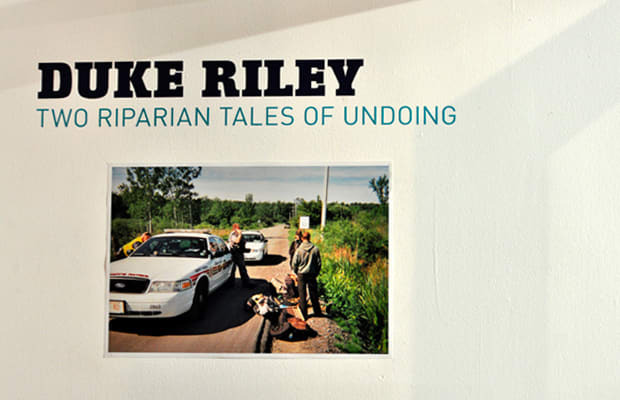 This past Friday, February 25th, the Magnan Metz Gallery in Chelsea hosted Duke Riley’s third solo exhibit: Two Riparian Tales of Undoing, an exhibit is made up of two parts: The first, An Invitation to Lubberland is a reconstruction of an exhibition Riley had at the Cleveland MOCA. It is a look into a prehistoric river under the streets of Cleveland, called the Kingsbury Run, where migrant workers/day laborers (hobos) lived from the 1870s through the 1930s. Duke Riley was able to get access to the river and filmed his travels through the tunnels, which are displayed on numerous screens in the exhibit. He also created mosaics with tile, nickels (including buffalo nickels with etchings from the once thriving hobo community there), and cigarettes (there is a tree stump mosaic created with only cigarettes). The second part of the exhibit is called Reclaiming the Lost Kingdom of Laird. This is a cool story about a small island in the middle of the Delaware River called Petty’s Island. Long ago, an Irish immigrant named Ralston Laird settled the island, proclaiming himself the King of Petty’s Island. The land was eventually taken over by an oil company after his house was burned down. While the island is now owned by CITCO (a Venezuelan company), a group called the Laird Kingdom Liberation Army, in which Duke Riley is a member, has taken action to reclaim the land for the Kingdom of Laird. It isn’t clear who makes up this Kingdom of Laird, but Riley had a letter he wrote to Hugo Chavez asking him to restore the land and to recognize the Kingdom of Laird. It may be a bit ridiculous, but it is also kind of interesting. The art consists of large, detailed drawings of hobo-esqe imagery; with fun “Easter Eggs” you find when you look closer. Things like a rat floating down the river in a Chinese takeout box, Tarzan taking a poop, and a Wii controller amongst the clutter. There is even a well made out of whiskey! For the opening, there were a couple music acts that performed in that old timey kind of way, dressing the part, to looks like hobos of yesteryear. The first was Lara Allen, who jumped on the reception counter and commanded everyone’s attention with her wooden staff. She sang a couple acappella songs, then Sweet Tooth Nelson stepped up, (accompanied by Brett Land on the banjo), who played two sets. Sweet Tooth Nelson plays some of the best folk of this generation and it was a great addition to the opening reception. "Two Riparian Tales of Undoing"